Mormons also are building “a kingdom not of this world” and are less inclined to participate in “saving the world” from a general secular point of view. We spend far more money on building temples to baptize dead people than we spend money to try to save living people who are dying of hunger or disease. Our priorities are the next life, not this. The Bonhoeffer ethos of individual Christian self-sacrifice in the moment is not exactly an LDS ethos. We are building Zion, as wheat among the tares. Great review, will be recommending this book to an elderly couple in my ward.The wife was born in Germany pre-war and enjoyed being in the Hitler Youth as a child, but moved to the UK and married a British man. Some years later she joined the church, and her husband has been interested in mormon experience during the war for many years as a good internationalist. Deep wounds for both of them, but I think they find comfort in Bro. Uchtdorf’s presence amongst the general authorities. I don’t think you build Zion by doing temple work or supporting or tolerating evil. You do it by relieving poverty, easing the burdens of those who are suffering, and helping to create a more just world. As the Givens have said, we should focus less on getting to heaven and more on making the world a heaven on earth. Also, J. Reuben Clark is one of my ancestors and all I can say is I’m extremely saddened and disappointed that he didn’t help those who needed it. It makes me feel a little sick actually. I never knew that about him. 1) The father of a friend whom I’d served with in Italy back in the ’80s had himself served in post-war Germany (I presume the American and/or British zone as likely even before the borders were effectively sealed off in 1948 the Soviets didn’t allow LDS proselytizing in their zone and like the predominantly-Catholic French weren’t too hep on the LDS faith in their zone either) related how during the war, once the American missionaries and the mission president were withdrawn, and the districts/branches were pretty much on their own, how many strange deviances in practices and even doctrines crept in. A modern-day Apostle Paul might well have recited Galatians 1:6 to the German saints once the Church could rebuild post-war. An example was the utter strictness some branch presidents established in allowing the Sacrament to be partaken, to the point that almost no one was allowed anymore. 2) Hitler was neither STRICTLY a vegetarian nor a complete ‘teetotaler’ (but did largely avoid meats and alcohol), but AFAIK he didn’t smoke or dip tobacco. Much of his rather strange and often bland diet was due to stomach ailments, either not helped at all by the drug ‘cocktails’ that his SS Doctor, Theodore Morell, concocted for his Fuhrer, or even exacerbated thereby. While his political, governing, and military deeds alone were enough to put Herr Hitler about as severely out of harmony with the Gospel of Christ (he denounced Christianity as a “jewish religion of weaklings” in spite of the Nazi party’s lip service to “Christian” values and the Church), I don’t see any evidence that he even knew of the LDS Word of Wisdom or would have given it any credence. His coincidental adherence to some of it is meaningless, being more the product of his driven ambitions to power (he considered Churchill to be a common drunk). For myself, I’d rather consider the wit of Sir Winston (who wasn’t actually knighted until after his second term as PM), with his trademark ‘Romeo y Julieta’ between his tobacco-stained teeth and a snifter of cognac or brandy in his hand. As for the German brother who ‘proved’ his ‘Aryanhood’ back EIGHT generations (when under the Nuremburg laws, if each one of his eight great-grandparents were unquestionably German, then his being a German was certain, so I could only four generations including himself), he was doing what he had to do to survive, knowing that being labeled a “Jew” was at least being stripped of citizenship, job, opportunities, and much more, at the time they didn’t even realize the extent. I can’t sit in judgment of what one has to do when serving under an ‘evil’ regime. I think of the 93-year old man who as a young SS soldier became the ‘accountant’ of Auschwitz (tallying items like shoes, gold teeth, etc. stripped from either live prisoners or the dead). In a culture and a military tradition of “behfelt ist behfelt” (literally, “what is ordered is ordered”), where disobedience and/or malingering can be punished by summary execution, it’s hard to judge whether the young SS-man performing this detestable job is a war criminal or not. Depends on one’s point of view. To some, his wearing the SS uniform sufficed, and indeed, our own US soldiers would routinely execute SS members taken prisoner unless strictly ordered not to, especially after the Malmedy Massacre. To others, only if the accountant can be proven to have used his position to go out of his way to abuse, torment, and murder his charges would he then be considered a criminal. I would ask to hypothesize what would have happened if in Vietnam Lt. William Calley and/or Capt Medina had been taken prisoner by the NVA or Viet Cong. Would they rightly have been able to conduct a trial and pass sentence (likely death)? It cuts both ways. Arthur Zander ran a soccer store out of his basement on 9th east across from Fairmont Park in Salt Lake City. It was one of the only places to get good Adidas football boots in SLC in the 70s. It was like a shrine to German soccer in his basement. To a soccer and Adidas loving kid it was a little slice of European football heaven. He would give out ball point pens with Arthur Zander & Sons on them that I loved. He also gave out miniature plastic cleats and soccer balls in a net to hang from your rear view mirror, which I still have. I was certainly shocked to hear about his Nazi past and his role in the Helmet Hubner story. Small world. He did play a part in getting youth soccer started in Salt Lake City. I don’t know the exact story there but my father was involved in the early days. forged an agreement with Joseph Goebbels propaganda ministry to purge daily newspapers of anti-Mormon articles, and arranged for his missionaries to publish positive accounts of the LDS Church in municipal newspapers throughout Germany. When the important Nazi party daily subsequently printed an article about Mormons that Rees did not like, he arranged for the Volksicher Beobachter to publish an article he had written that drew numerous parrallels between Mormonism and Naziism, and between Utah and Germany. 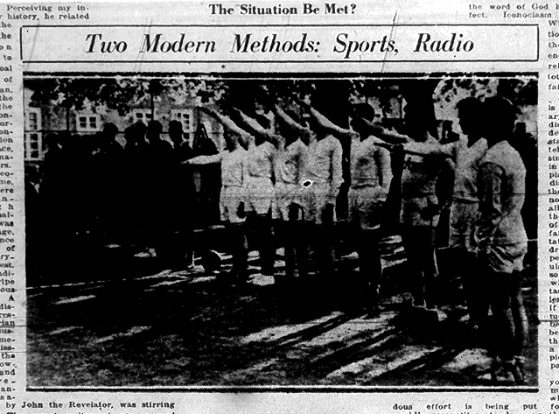 The same Deseret News article that proclaimed the Mormon Fast Sunday as the model for Nazi Winter Relief also told its readers that: “There is another noticeable trend in the Mormon direction. It is very well known that Hitler observes a form of living what Mormons term the Word of Wisdom. He will not take alcohol, does not smoke, insisting on plain and wholesome foods, largely vegeterian. convinced themselves that Hitler had read the Book of Mormon and was a secret church member. Mission president Roy Welker, whose wife rode with Hitler in the Fuhrer’s limousine, told a civic meeting in Salt Lake City in 1937 that “Jews are safer today in Germany than they are in many parts of the world.” Such absurdities do not seem as preposterous when seen through the eyes of those dedicated to serving bigger causes–Mormonism and Naziism. Arthur Zander was the leader who erected the sign, “Juden ist der Eintritt verboten,” on the St. Georg meeting house door, a proscription aimed at Salomon Schartz, the sole Mormon of Jewish heritage who visited. Zander also refused baptism to another man of partial Jewish lineage who desired to become a Mormon, Rudolph Kaufmann. Otto Berndt, who had the authority to override that decision as the acting president, baptized Kauffman into the church. While in the camp, Worbs had been treated, in Berndt’s words “worse than an animal.” Worbs came back with a swollen mouth, missing all of his teeth. On several occasions, guards had chained him outside in winter temperatures, stripped naked, knee deep in snow for periods of up to forty-eight hours. They positioned him so that water would drip on his hands, which would then freeze. Periodically, a guard would appear with a rubber hose and sadistically beat Worbs hands in order to remove the ice and “warm you up,” as the guard would say. That broke his fingers. Six weeks later, Worbs died. The last weeks of his life were not pleasant. According to Rudi Wobbe: “What upset Helmuth and me the most was the way the other members of our congregation treated Brother Worbs upon his return. Rather than rally to his defense to comfort him, many turned a cold shoulder, refusing to speak to him. He was ostracized because he ‘kicked against the pricks’ by opposing the government. Many, I suspect, were afraid to be seen with him for fear the Nazis would suspect them as well. This is a serious issue preventing new members from joining the church or trusting it’s seemingly blind faith in leadership and the very priesthood itself. My husband strongly referred to the issue as part of why he lost his testimony. It doesn’t make me lose my testimony, but it certainly makes me question it and feel ashamed. I realize times were very different and I cannot likely understand them fully, but how can any christian not protect Israel and the Jews? They are God’s chosen people who sprang forth his first words. Christianity has had many bad relations with Jews in the past, stemming from perceived blame in the gospels for Jesus’ death. The Crusades, the Inquisition, even some tenets of protestant reformers. Historic Christianity cannot be viewed as being totally above anti-semitism. Cultural prejudices are too deeply embedded. As for the ‘Jews’, or ‘Israel’ (and never mind the ever-wrangling of just WHO is included in ‘Israel’?) being “God’s Chosen People”, it’s time both LDS members and Christians in general quite swallowing that bait. They WERE a covenant people, but like the Jaredites, Nephites, and others, some of whose tales are yet to be revealed, and likely ourselves in these ‘Latter Days’, they endlessly went through cycles of pain and persecution, prosperity, then arrogance and apostasy, then breakdown and ruin, only to repeat (and lather and rinse?) until the Lord had enough. The interesting thing about the scions of Judah (of which the Savior is the ‘Lion’, ref. Genesis 49:9 and Revelations 5:5) is that in the Book of Mormon they are denounced as being the only nation that would crucify their own God” (II Nephi 10:3). So I suppose that either Nephi of old or Joseph Smith, depending upon who you believe authored that passage, is a horrible anti-Semite. True, everything promised to Abramham, Issac, and Jacob (Israel) WILL be fulfilled, but through the new and everlasting covenants as brought forth in these latter days via the CURRENT living Prophets and Apostles. They are as welcome as anyone (which the sad account of a German branch president forbidding Jews make me cringe) but must enter via the proverbial ‘strait and narrow’ gate (Matt 7:14). The trouble with ‘defending’ the ‘Chosen’ or anyone of our brothers and sisters from evil is that life doesn’t always hand down easy choices. Consider the dilemma of Monsieur LaPedite, a humble dairyman in French ‘cow country’ in 1941 (yes, it’s fictional but not an unrealistic portrayal). He is paid a visit by the smarmy and loquacious SS-Standartenfuhrer Landa, aka the “Jew Hunter” (who at first relishes the moniker as a nod to his ability to ‘think like a Jew’ and be so proficient in finding them, later resenting it as he considers himself merely a ‘damn good detective’ who happens to wear an SS uniform), who, though certain that his quarry (the Dreyfus family) is hiding in the LaPedite home, rather than merely barging in and exposing them, uses a subtle mixture of charm and psychological pressure to get Monsieur LaPedite to give up the Jewish family voluntarily. Is it ‘cowardice’ that causes it? Hardly, we can see that the French farmer is a brave and just man. Rather, he’s been caught and knows it, and realizes that his first duty is to protect his own family, which the Nazi would-be ‘Sherlock Holmes’ (even sporting a Calabash pipe) points out, holding a promise of forgiveness and being left alone for sheltering ‘enemies of the state’, so he tearfully betrays them. One of the great evils of war is that it places good men in the position of making awful choices. Remembering that the Saints had been accused of being abolitionists by the old settlers of Missouri, and that they were also accused of flouting the law as regards polygamy in Illinois at the time, the 12th Article has always seemed to me to be a sop to those who were concerned that the Saints were a large, organized, semi-rebellious element antithetical to American society. Clearly, we don’t believe it to be absolute, or we’d be condemning the American Founding Fathers as traitors. Unfortunately, we’ve internalized it to the extent that we as a people are now unconscionably complicit in the degradation of individual liberty in the United States, with a large number of Latter-day Saints employed by the internal security apparatus and even providing the legal rationalization for terrible human rights abuses. Any time your stake president or bishop tells you that the 12th Article forbids you from speeding or changing lanes without signaling, raise an eyebrow and lead him in a rousing chorus of “God Save The Queen.” Chances are, he won’t be able to follow a discussion of malum in se versus malum prohibitum, or the disintegration of the tradition of common law in modern America. Douglas, your rejection of Jews as a chosen people is completely contrary to what is in the scriptures. The claimed author of that statement is Jacob, the younger brother of Nephi. Keep in mind that Jacob, Nephi, and the peoples of the BofM considered themselves Jews. The denunciation of the Jewish people was being made by Jews themselves, something which was frequently done by OT prophets, btw, and noone claimed them as anti-semitic. Yes, the BofM and NT make it clear that obedience to covenants is more important than lineage, but the idea of the House of Israel being the chosen/covenant people is very much a part of Mormon doctrine (whether you’re talking patriarchal blessings or prophecies of the latter days). As to the OP, I think it’s good to point out the messiness of history. Mormons have had a tumultuous relationship with civil governments, and I think after the disasters of the 19th century the pendulum may have swung a bit towards whatever cooperation was necessary to protect as many members as possible. Cultural prejudices have more impact than we like to admit in our church. Younger generations are aghast that the church could have ever supported the priesthood ban, or like in this book, cooperated with the Nazi regime. When I ask people of older generations how the justified such behaviors, I get shrugs, “It’s just how we did things. We didn’t see it as wrong.” I often get unnerved at the idea of future generations looking at us shaking their heads at the stupidity of our current actions, especially since I’m probably not even noticing my worst offenses. #12 – Mary Ann, Jacob and Nephi knew their lineage was from Manasseh, son of JOSEPH (once sold as a slave into Egypt). They would have considered themselves of the House of ISRAEL, but most certainly not of Judah, therefore, they would not be JEWS. They did look back to the erstwhile Kingdom of Judah (which was actually Judah and Benjamin, the two sons of Jacob and Rachel, though the existence of Lehi et al. demonstrates that likely people from all the tribes as well as non-Israelites resided therein) b/c that’s the nation from the ‘Old World’ they once knew, hence why in Alma 7:10 (which BoM critics like to use though it actually gives a more likely contemporary phrase) the expression ‘Land of Jerusalem’. But when Nephi had gotten the brass plates from Laban, they were able to discern their true lineage which Amulek expounded on some 500 years later (Alma 10:1-3). Don’t get me wrong. Nephi’s denunciation of the “Jews” wasn’t intended to be an excuse for gratuitous anti-Semitism, nor a further ‘take that’ in sibling rivalry expressed many centuries later through their progeny. It was to point out that particular group of people (not necessarily the same as what people think of ‘Jews’ today, if Arthur Koestler’s “The Thirteenth Tribe” has any validity) were the only ones capable of crucifying their own God. Such a denunciation is likely not applicable today, judging by the integrity and gentle natures of many observant Jews that I’d been pleased to interact with. You’ve committed the familiar error of conflating one of the tribes of Israel with the whole tribe itself, something that the old patriarch and his twelve sons would strenuously object. It’s done all the time, even by the Prophet and in common LDS parlance, but that doesn’t make it correct. The “Jews”, IF indeed they’re truly of Judah (theories abound about most ‘Jews’ actually being descended from the Khazar tribes, but I believe that there are still plenty of Judah’s progeny running about, whether they consider themselves “Jews” or not), will one day, along with their fellow peoples of Israel (many of whom are ‘hidden’ and IDK how and/or why, but the Savior knows where and who they are), embrace the Gospel and renews their one-time covenants. If your meaning of what you term “jews” are all those that the Savior hasn’t forgotten and WILL keep His promises, then we agree. Where I disagree with this whole ‘Chosen’ concept is that it gives any group of people particular favor or dispensation. As the Savior Himself revealed to Peter, “Rise, Kill, and Eat…” (Acts 10:13). The Gospel is for EVERYONE. #12 – this is not unlike criticizing Brigham Young as being ‘racist’ (not necessarily by the culture of his day, he wasn’t) or even picking on leaders of more recent times. I enjoying poking fun at the late Mark E Petersen not b/c I believe him to have had any deficiencies in character (indeed, from what I knew then even though I was quite new in the Church and read of him later, he was quite Christ-like and nothing like what we consider some venomous ‘racist’ to be), but b/c he’d been raised, obviously, with racial attitudes which in 1954 might have been considered socially acceptable but some 61 years later would at minimum be ‘quaint’. I’m still waiting for all the ‘Negroes’ (including those including in the “Book of Negroes”) to thank Elder Petersen for ‘letting’ them drive Cadillacs if they can buy them! Rather than breast-beat, crap, or find fault, we ought to merely chuckle and realize that the Lord works with MEN with their faults and/or idiosyncrasies. I can’t include the dear sisters as to THEIR faults b/c I’ll get showered with high heels thrown my way, and them things got points on ’em! #1 – I would never compare what early Mormons went through with what the Jewish people went through, and I would certainly not use the expression “little holocausts” to describe what Mormons went through. But that’s just me. I can’t help but wonder why the church leaders worried about these sensitivities but were so unconcerned with the sensitivities of homosexuals for so long. One can respect Jews and the Jewish faith, and support the right of Israel to exist, but still oppose certain aspects of Israeli foreign and domestic policy. Certainly, a lot of Israeli citizens do. #18 – No one should have ‘issues’ with respecting Jews and/or their faith (not all “jews” are ‘religious’, but some ARE and are even members of the Church.) As for the ‘right’ of Israel to ‘exist’, it’s no different than the same right of Brazil, or Norway, or Cambodia to likewise ‘exist’? I’d say that sure, we Americans oppose aggression against our sister nations as we would resist it against ourselves, but like Thomas Jefferson said, “Peace, commerce, and honest friendship with all nations. Entangling alliances with none.” I would support any legislation that allowed those that want to support Israel with their own funds to do so, but vehemently oppose my country’s getting involved in their foreign policy and/or military affairs. And experience shows that the Israelis can well take care of themselves. Douglas, “Jew” is a reference to those of the House of Israel living in the country of Judah prior to the Babylonian captivity, as well as their descendants who resided in “Judea” at the time of Christ. Many Jews today proudly claim descent from tribes other than Judah. Descendants of the tribe of Levi, particularly the lineage of Aaron, are awarded significant respect. Nephi and Jacob were likely very aware of their lineage from Joseph prior to leaving Jerusalem as they targeted Laban, a distant relative, to acquire the brass plates. There were several times noted in the OT when individuals from the northern tribes moved to the southern kingdom, sometimes because of religious reform and other times to escape the horrors of the multiple waves of Assyrian conquest. Again, Jew refers to people from the *kingdom* of Judah, not *tribe* of Judah. Gandhi once said that Forgiveness is the attribute of the strong. because i have been given much and have been forgiven by god countless times, ill forgive you. but you need to know that this is gods church and we are his people. go ahead a defile us, rip our church down, and come up with whatever you want to try to keep us from pressing forward with love, but you’ll never win. when we get kicked, we stand back up but much stronger. so thank you for your help in the building of the kingdom of god.